Work week was a success! Our thanks to all the volunteers who came to help, especially to those who came from other states at their own expense. Much credit goes to two young men, Dale and Nathan Shirley, who came from California to work on this project. They took several days off of work to be here. Dale is my son, Nathan is Barbara's son. Those who have attended Shirley Conventions and meetings will remember Barbara, my niece, who travels with me. Large boulders were walked and rolled from the field across the street from Obediah's house by Dale and Nathan to secure the foundation after getting it leveled. No easy job! It was they who did most of the work in removing the old roof and sheeting the two story old house preparing it for a new roof. All the workers agreed they were the key help in getting the more difficult work accomplished. Our thanks to them for their dedication! There were others who were very devoted to this project and worked very hard too! Nathan's father, Lee Shirley and Guy Shirley, Dale's father and my husband. Guy's sister and her husband, Mildred and James Massey, also came with us from California to work on this project. James was very helpful. 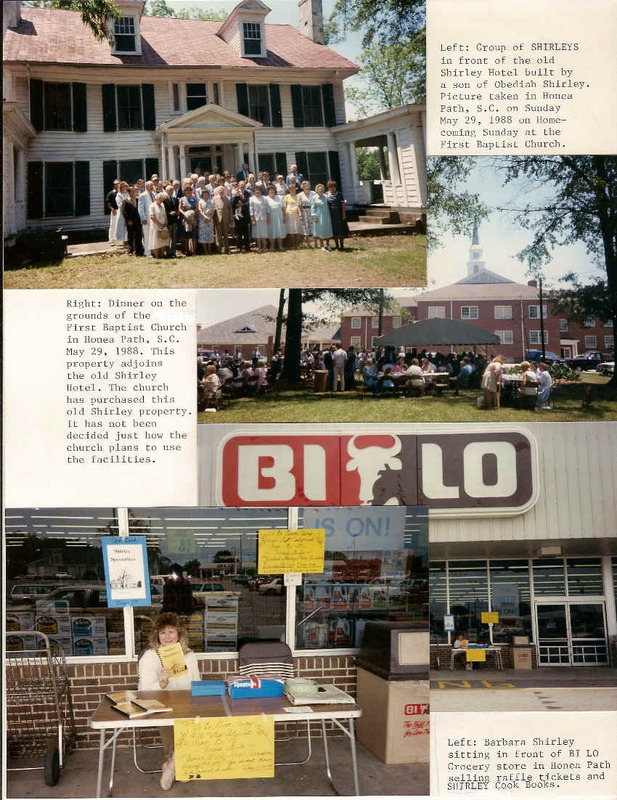 Mildred worked with Dot Ricketts with meal preparations and clean up. Julian Ricketts was with the gang working where ever he was needed at Obediah's house. I might say here that Dot and Julian Ricketts let the California gang take over their house. They slept up the road at a relatives and let us have their bedrooms. They'd come back in the morning and get breakfast for us before we all took off for the day of work. Not many would be so kind to do that. They are special people! Another person who came one morning was John Shirley from Anderson, South Carolina, just a few miles away. He came to take some pictures before we took the house down he said. He took his pictures and stayed the rest of the day working with us as we were not taking the house down. The next day he was back to work and the next day also. He did not descend from Obediah Shirley. His ancestors are branch #20 the Armstrong and Indiana Co. Pennsylvania Shirleys. There were many others who came to work on the old Shirley house. Most were descendants of Obediah. I will try to remember the names but forgive me if I miss a few. Mary Keith Oakes and her husband Ellis Oakes, Carol Scott of New Jersey, Marcia Hyde of Berkeley, California, her father Joe Anderson who flew in from Southern California, Sue Henderson and husband. Several churches in the area provided food for the workers during the work week. This gave us a chance to meet some of the local people as they stayed, served us and ate with us. We had a time of fellowship with them. The First Baptist Church opened the old Shirley Hotel for accommodations for the workers. We are most grateful for their acceptance of our presence in their community. 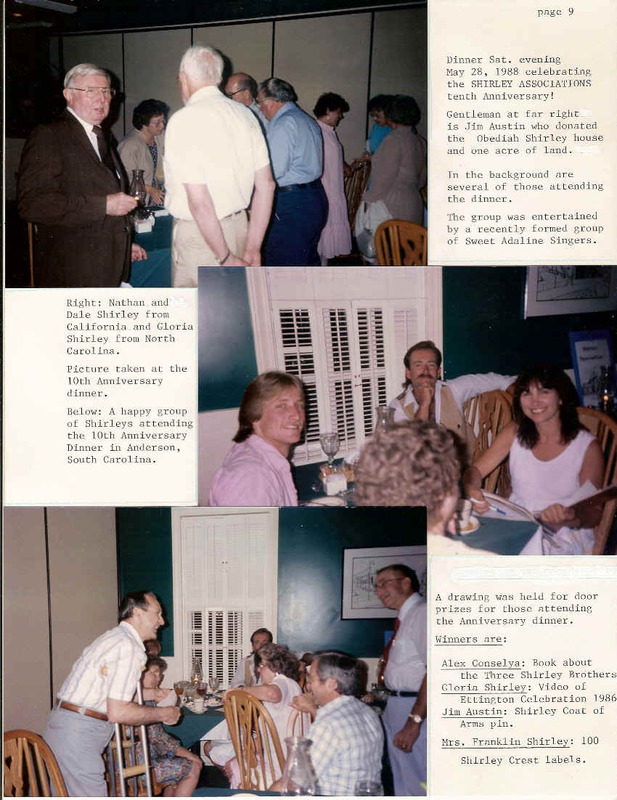 Saturday evening was the 10th Anniversary Celebration of the Shirley Association at Bradens restaurant in Anderson, South Carolina. 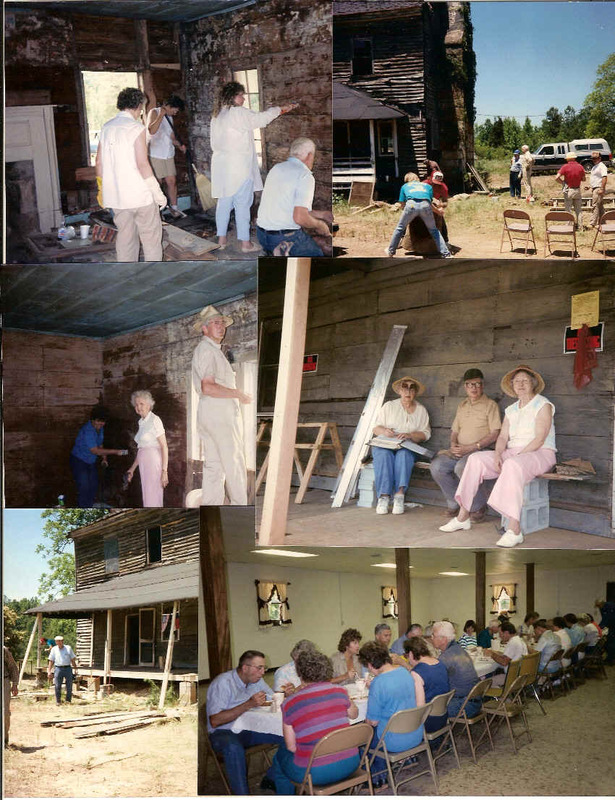 We were joined by Jim Austin, (who donated the Obediah House), Gloria Shirley from North Carolina, Alex and Jean Conselya, Mr. and Mrs. Fletcher Shirley, Mr and Mrs Conny Shirley from GA, Lydie Thomas and many more including those who worked on the Obdiah house. We were entertained by the Sweet Adaline Singers. Sunday was Homecoming Day at the First Baptist Church in Honea Path. What a time we had with all the food and good company! Monday, Dale, Nathan and Lee Shirley flew back to California and to their jobs. Some new Obediah descendants came to help work on the house. We stripped some walls of old wall paper and removed thousands of nails from all over the walls, raked up the old black roofing and many people did not look white anymore...smile! It was a messy job. We accomplished much in the week we were there. 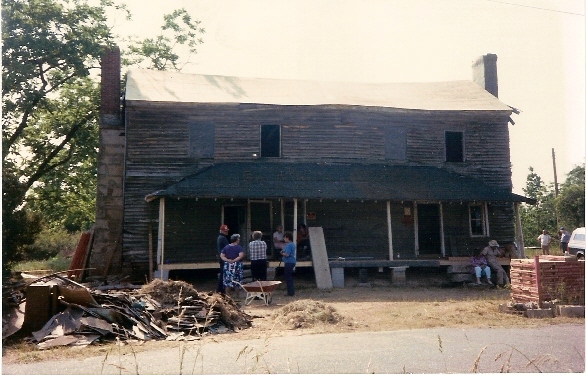 Top left: Barbara removing nails from the walls, Top right: Dale and Nathan moving large boulders from across the street to the Obediah house to level foundation. 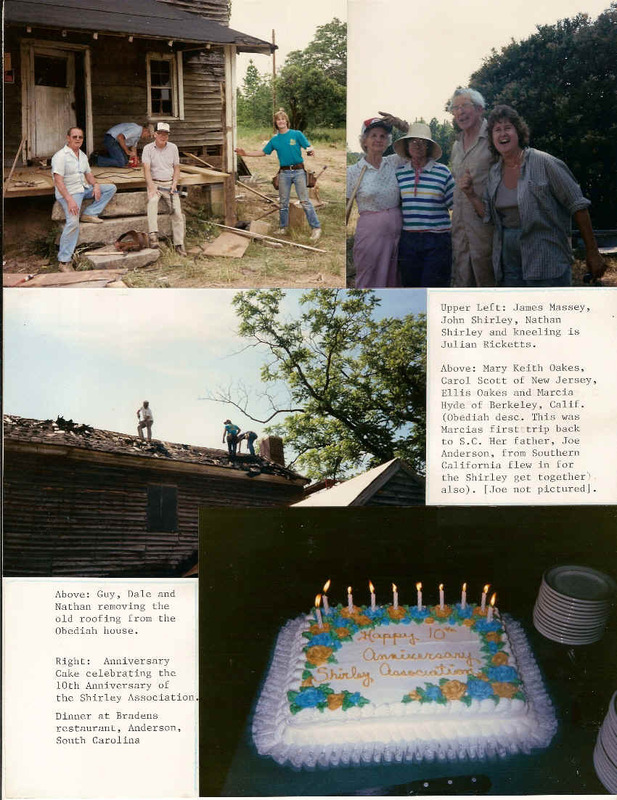 Center left: Shirley Faye and the Oakes removing wall paper. Right: Sue Henderson, her husband and Lydie Thomas. Lower left: Julian in front of Obediah's, right: crew at lunch.